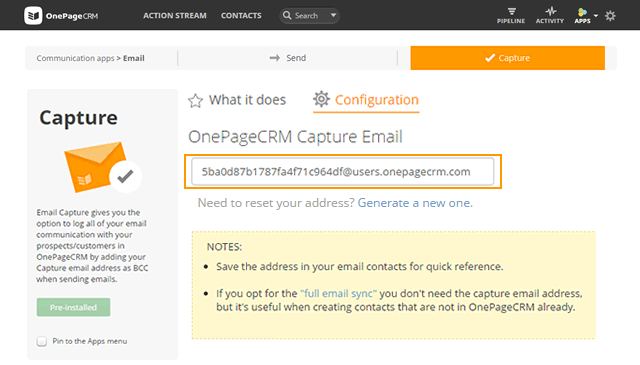 Your Capture Email address allows you to log email communication with your contacts from your email client in your OnePageCRM account. We would recommend storing a copy of your Email Capture address as a contact in your address book for easy access when emailing directly from your email client. 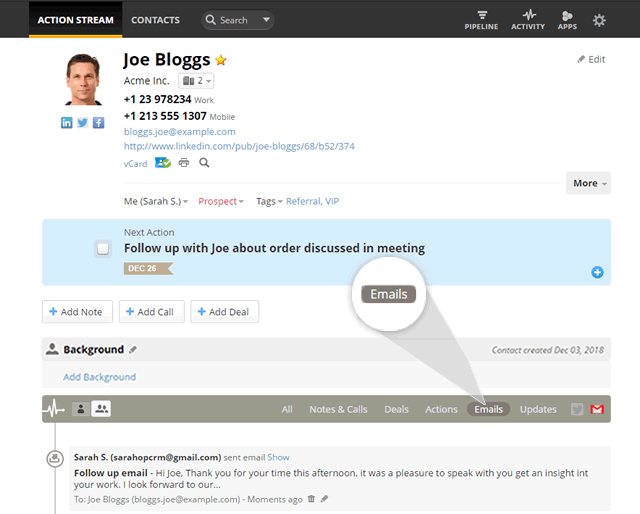 Respond and store an email from your email client in OnePageCRM Where are emails logged in OnePageCRM? Go to Capture. Your OnePageCRM Capture Email address is found here. Note: To generate a new Email Capture address click on ‘Generate a new one’. Forward the email and in the To field put your Email Capture address to log this email in OnePageCRM. Reply to a contact from your email client and paste your Capture Email address into the Bcc field so the email is logged in OnePageCRM. Where are emails logged in OnePageCRM? Captured emails are logged under the contact’s Emails timeline tab. Note: Emails or attachments must not exceed 10MB per email. 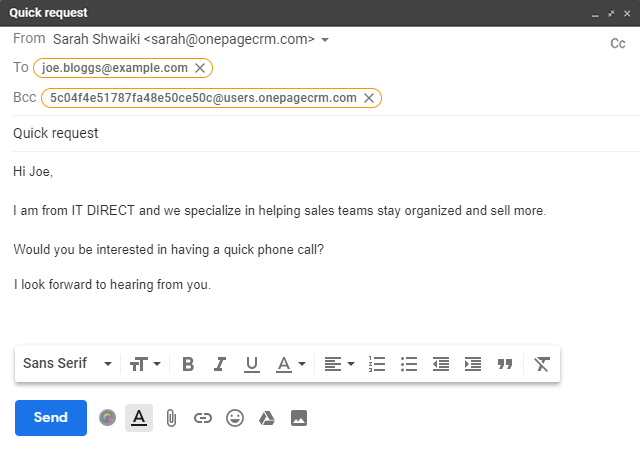 If the email address doesn't exist in OnePageCRM but the Capture Email address has been added in the To or Bcc field, the email will be sent to the Notifications area in OnePageCRM where you have the option to assign it to an existing contact or create a new one. Your total storage allowance in OnePageCRM is 2GB. If you've reached your allowance, please contact support. Emails will be logged within a matter of minutes, but from time-to-time users may experience a slight delay depending on the volume of emails being processed at that time. The subscript number on the top right corner on the Email tab appears when you have an unread email assigned to this contact.